Embryolisse, the French apothecary skincare brand since 1950, is expanding its retail distribution by launching their #1 cult product Lait-Crème Concentré throughout Canada. Embryolisse’s cult 3-in-1 moisturizer, primer and makeup remover, Lait-Crème Concentré, will be available in two sizes throughout Canada at select Shoppers Drug Mart doors beginning this September 2017. “Consumer demand for Embryolisse products is growing in Canada and we are thrilled to expand our retail distribution to the trusted retailer Shoppers Drug Mart; now our Canadian customers won’t have to travel to France to stock up,” says Michelle Shaffer, President of Embryolisse North America. Embryolisse has developed a devoted following and has become a beauty secret with legendary status among makeup artists, supermodels, celebrities, and fashion and beauty insiders. It is a makeup must-have passed from generations of mothers to daughters. 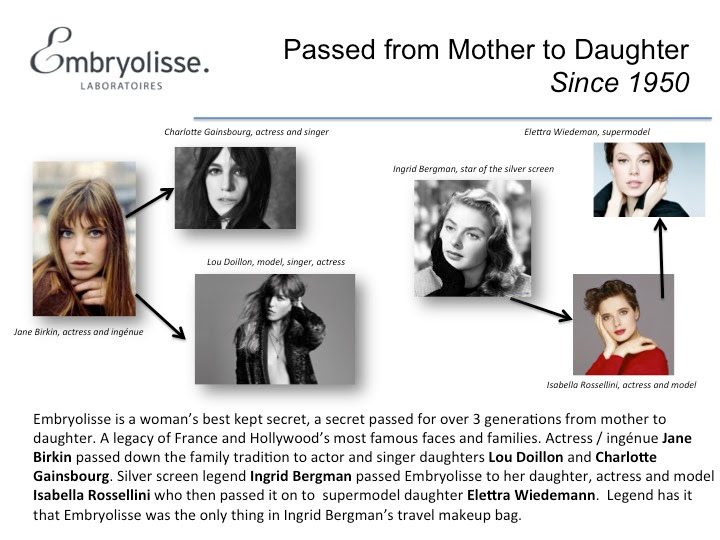 Most notably, style icon and English actress Jane Birkin swore by this cream of her grandmother’s and bestowed this beauty secret to her daughters Charlotte Gainsbourg and Lou Doillon, who both tout the benefits of Embryolisse products to this day. Founded in 1950 in France, Embryolisse was created by a physician as a pharmaceutical skincare brand to meet the standards of the medical profession. What began with the signature product Lait-Crème Concentré has grown into an innovative derma-cosmetic line with over 30 products ranging from moisturizers, cleansers, serums, anti-aging and now artist’s secrets available around the world in dermatologist offices, apothecaries, beauty boutiques, and drugstores. Synonymous with quality and skincare excellence, Embryolisse is a cult beauty brand and an everyday necessity to women and men, and beauty aficionados everywhere. The must-have skincare product in every makeup kit and medicine cabinet, Lait-Crème Concentré is a nourishing, 3-in-1 multitasking moisturizer that primes, hydrates, and removes all traces of makeup. Great for all skin types, a combination of shea butter and emollient oils reconstitutes, rejuvenates, and repairs the skin for a healthy-looking complexion.